Kazakh national movement led Syrym Datov was directly connected with the beginning of the government’s attempts to regulate the internal life subservient Kazakh tribes. In fact, the tumultuous events in the Junior Juz in the late 18th century were an echo of Peasant War of Pugachev, where Bashkirs took an active part and part of the Kazakh tribes. At first moment, in order to reduce the intensity of «pugachovshchina» Catherine II went on a pretty big concessions related to the resolution of traditional nomads places, river and lake land, expropriated in connection with the extension of the Ural, Orenburg and Siberian Cossack Army, organization boundary lines in the Urals and Irtysh. By the decree of November 7, 1775, the Board of Foreign Affairs allowed to Kazakhs use pastures in the area between the Urals and the Volga, on the shore of the Caspian Sea, on the right bank of the Irtysh. However, these actions occurred on contrary to the measures that already undertaken by the colonization of these areas. In fact, these lands have either been occupied by the Cossack state-owned farms and arable land, or were planned so. In 1782, a decree was issued, where was explained that in the case of moving cattle on these lands, pre-payment is required for their «recruitment». But this measure was not enough, particularly, Ural Cossacks took the initiative by requiring the provision of hostages (hostages) while passing through territory controlled by the army, and then board the troops altogether banned Cossacks surrender land lease, that is actually forbidden transition Kazakhs for Urals, the «inner side». In response to it followed real rebellion, numerous raids on outposts and fortifications retaliatory punitive expedition. At the same time infighting was in the Junior Juz. After going under the patronage of the Russian value Khan’s power declined, vertical feudal pyramid Khan — sultans — tribal elders fell apart, each of the chapters of their own labor sought to negotiate with the border and the central administration. To troubleshoot the anarchic confusion, Orenburg Governor-General Igelstrem proposed the convocation of the Congress of Elders, peculiar steppe Parliament. But after Srym Datov was chosen as the head of the Congress, he began to resemble a noble Sejm, in 1789 Igelstrem preferred recovery of Khan’s power, which led to increased internal conflict and open insubordination Russian administration, increase in the number of attacks on the border line, full stop trade with Central Asia during all of the 1790s. Only to 1797 by a large trade with the elders, sultans failed to appease the majority of Kazakh tribes and rebellion began to decline. Syrym Datov was forced to migrate to the land of Khiva Khanate. One of the largest cities in Central Asia, now the settlement in Otrar district of South Kazakhstan region. The largest settlement Otrar oasis known as Tarband, Turarband, Turar and Farabi. The settlement Kuyruktobe, Kok-Mardan Altyntobe Mardan-Quick also adjacent to the oasis’s territory. Prosperity of Otrar oasis was during the period from 1st to 13th century AD. The city was inhabited before the beginning of the 19th century. The mints of Karakhanid dynasty was in Otrar (Parab). 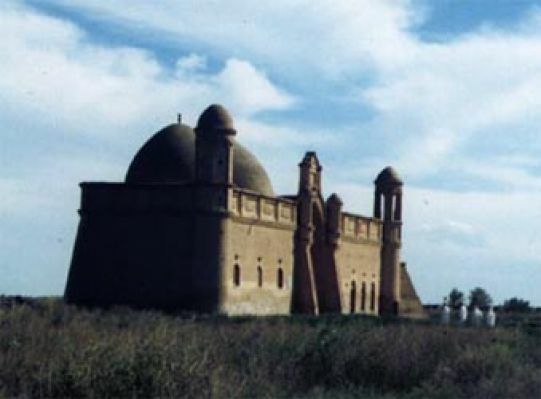 In the beginning of the 13th century, the Otrar city became part of Khorezm state. There is a possibility that Otrar was the center of Farabi, on copper dirhams Khoresmshah Ala ad-Din Muhammad made in Otrar in 1210–11, the stands «Parab», and in his own minted 1216–1218, — «Otrar», which placed before the word balad (meaning «city» and «country, region»). In the two hundred thousandth Otrar growing up in the place where the river Aris merged with the Syr Darya, settled scientists, sages, skilled musicians, fortune tellers and jewelers. The city had a large madrasah, marketplace, shop, blacksmith shop, milling Khan (the place where drank wine), sauna, mosques, shops nearby. Kair Khan, the uncle of Khoresmshah from maternal line, was a head of the city during the Mongol invasion. According to historical records, after execution of Genghis Khan’s ambassadors, in 1219 the city was besieged by the Mongol armies under the leadership of the eldest son of the conqueror, Jochi. The siege lasted seven months. Famine started in the city and dissatisfaction of refusal to negotiate with the Mongols, one night one of the inhabitants of the city opened the gates to the Mongols. Mongols after capturing the city destroyed the majority of the population. The rest of them taken into slavery, the city was burned and destroyed. Traitor named Karaj, opened the city gates, was executed personally by Jochi. In the 15th century, the town was rebuilt. In January 1405 in Otrar Tamerlan died in the beginning of his campaign to China. Otrar — the birthplace of many scientists such as Al-Farabi the outstanding medieval mathematician and philosopher, Abbas Zhauhari (with al-Khwarizmi participated in the drafting of astronomical tables), astronomer and mathematician and Ishaq Al-Farabithea, linguist and geographer. In Otrar lived and preached a famous Sufi Arystan Bab, near the mausoleum of settlement Arystan Baba (Arslan-Bab). A famous Sufi Arystan Bab lived and peached in Otrar. The mausoleum of Arystan Bab (Arslan Bab) located near the settlement.